The British Empire–the loving, moralistic parents no one asked for. 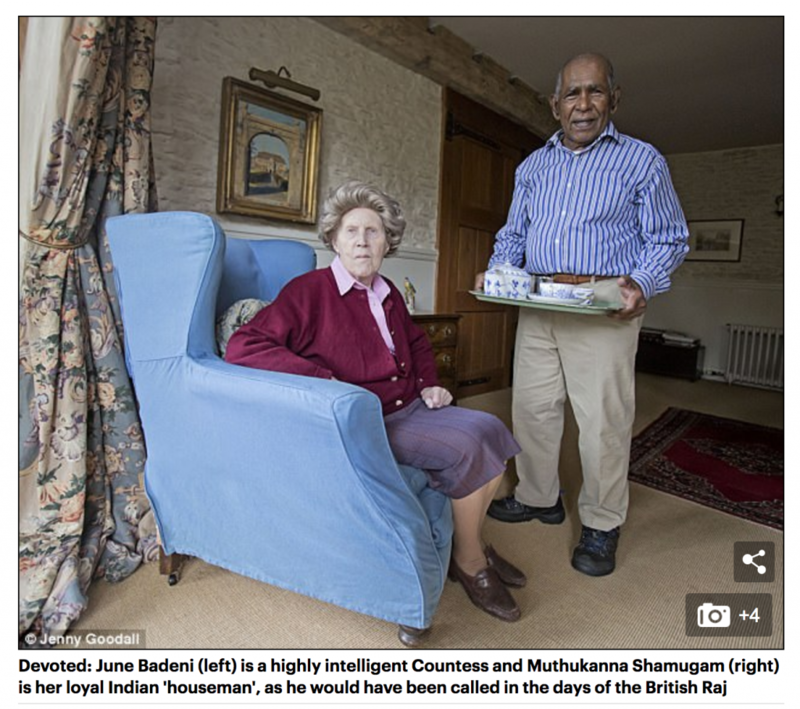 In a recent Daily Mail UK article, the post-colonial-yet-still-horribly-colonial relationship between a countess and her Indian houseman was lauded as an “enchanting” harkening back to romantic times. There is nothing romantic about this–it’s a relationship of exploitation and white supremacy. Countess June Badeni and Muthukanna Shamugam, the article claims, have been together for 60 years. Muthu is described as a loyal devotee serving the Badeni family. He remains illiterate, despite being in his 80s, and unable to speak “Indian,” the article says. How charming. While the Daily Mail isn’t known for having accurate portrayals of historical events (or even logical ones), this is ridiculous. Muthu’s service to the Badeni family is a holdover of England’s colonial hold on India. Muthu was imported, like so many others, as labor. While the Daily Mail would argue that Muthu’s service to the Badeni family comes out of love–and the oppressed do often love their oppressor, Stockholm Syndrome is very much part of institutions of subjugation–it also fails to mention the racist treatment he receives. Muthu has been stripped away from his family and home so much so that the Daily Mail claims that English is the only language he speaks – that he speaks “no Indian”–and his English, too, “is still sketchy.” June Badeni, the woman who “took him in” and he now takes care of, told the Daily Mail that Muthu was “in some ways her first child.” He is infantilized and spoken down to. This is not a happy story of colonial innocence and bygone days. The outlet also claims that Muthu is devoted to English customs, which it describes as stuck in the ’50s. And I really cannot tell if this is satire or not. The Daily Mail reflects an overwhelming notion that the British Empire was some kind of positive presence in history with a few collateral negatives. White Britons may remember the Empire differently from those of us who were subjugated, but stories like Muthu’s cannot be associated with any sort of affection. His is one of abuse and exploitation. He is a microcosm for what the Empire sought to do with us. He may have been more than happy to be “taken in” by British aristocrats, but he is not our proxy. June Badeni considers this man, who is close to her in age, a child. This condescension justified the British Empire too. They didn’t even consider us full people when they claimed the Subcontinent for themselves. We were resources to be mined and children to be taught. This article is a knife twisted in our still bleeding side.